In Class 11 we used Nupastels and I hated them! This isn't a surprise, I didn't like using pastels in several prior experiments here at home. So there is no photo of that drawing because I didn't even want to spray it with fixative and bring it home. Last night, in Class 12, we were given a choice of more pastels or a medium of our choice. I did the 4 five minute poses in charcoal (General extra soft pencil) and then switched to Sanguine Conte. I'm actually enjoying drawing with these, and feel as if progresss is being made. This was my long pose for the evening. I loved the mirror that our Professor placed behind the model. Only 3 more classes in this Fall semester course, which makes me sad. 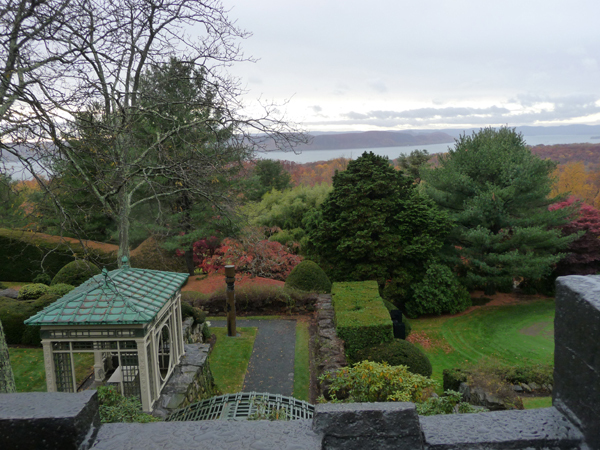 We just returned from a two day visit to Tarrytown NY. 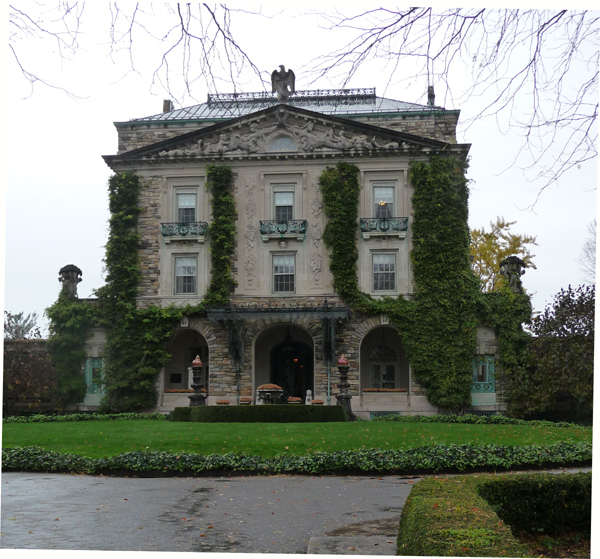 Yesterday we took the Grand Tour of Kykuit, the country home of John D. Rockefeller, his son John D. Rockefeller Jr., and "Junior's" son Nelson Rockefeller (4 time Governor of New York State/VP under President Ford). 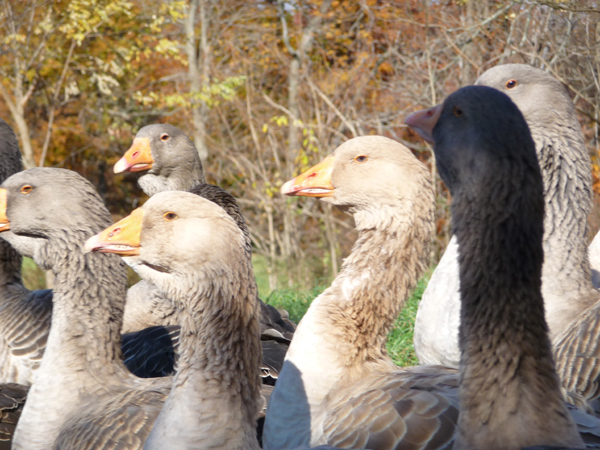 It is a 40 room, 6 floor house set high on the Eastern shore of the Hudson River. It is now a United States Historic Trust Site and it is really worth a visit. 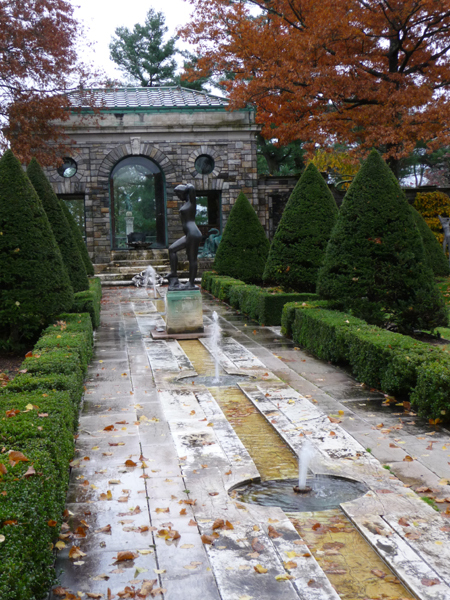 The house is beautiful and comfortable and the surrounding gardens are amazing - especially the modern sculpture collection everywhere that you look. In 2008 Forbes calculated that John D. Rockefeller was worth 663 billion in 2007 dollars! 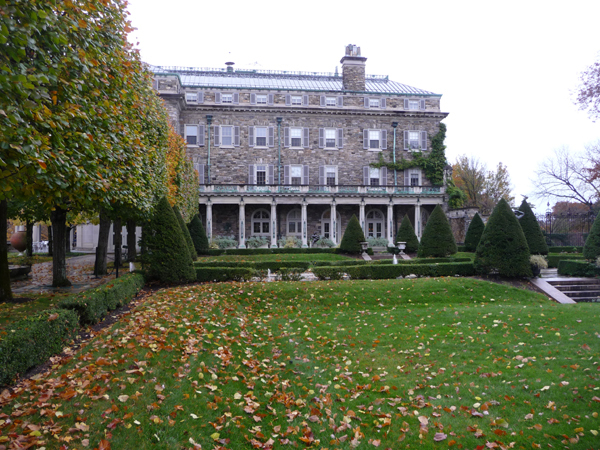 This is the Southern facade facing one of the formal gardens. You can see 4 floors - the other two are below ground. No photos were permitted in the house, but I did two VERY Quick sketches as our guide was talking. 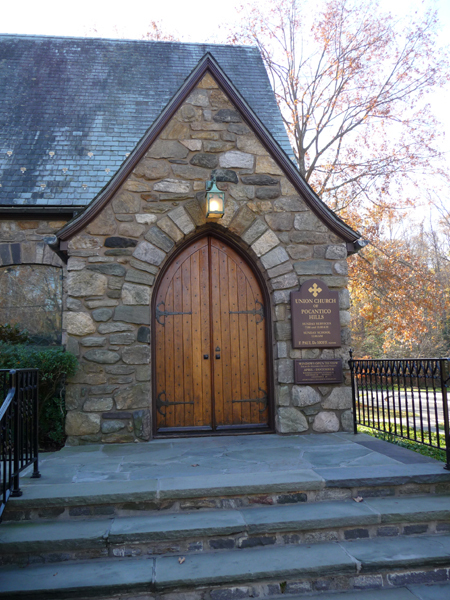 Today we went to the Union Church of Pocantico Hills - of which Rockefeller family members were founders. They commisioned Matisse to design a Rose Window in honor of Abby Rockefeller - and he finished the paper cut designs 2 days before he died. The family then commisioned a very large stained window by Chagall at the back of the santuary in memory of John D. Rockerfeller Jr. Chagall visited the church several times and after completion of another stained glass window for the side of the santuary, he proposed replacing the plain glass windows for the entire santuary - 8 more total. 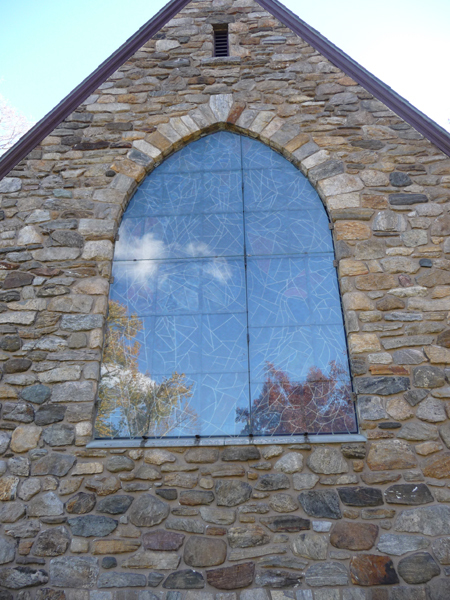 These are the only cycle of Chagall church windows in America. There is a modest entry fee, but it is amazing and well worth a visit. 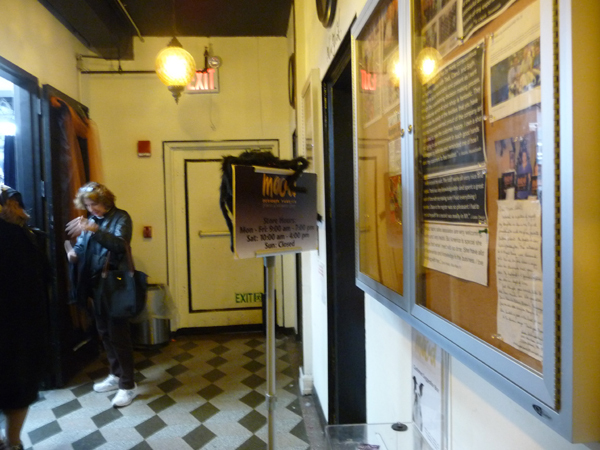 No photos were allowed, but here are photos for the modest entrance and the largest Chagall window from the outside. 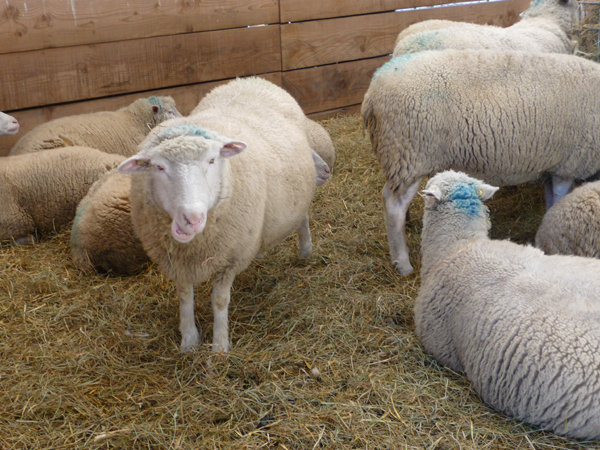 We went to Tarrytown primarily to have dinner at Blue Hill Restaurant - which is set in the Stone Farms Center for Food and Agriculture - a non-profit experimental station. The resturant serves food grown or raised on the farm and it is unique and DELICIOUS! 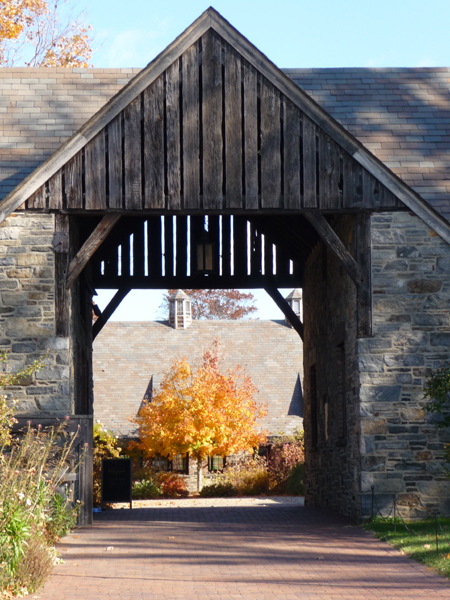 This is the entrance to the Stone Farms inner courtyard - all constructed from the old barns - and my photos of sheep in the barn and toulouse geese out in the grass. Each class begins with 4 Five Minute poses of the model just for us to warm up. Now we spend the rest of the 3 hours with one long pose - with periodic breaks for the model during which the Professor shows us prints to demonstrate specific techniques as done by master artists. 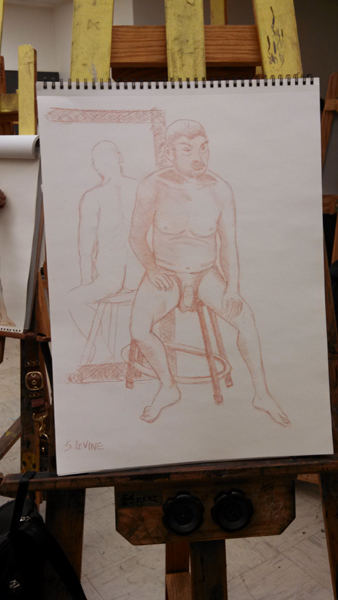 Last week our assignment in class was to draw any part or all of the model using black and white charcoal with sanguine conte - red, black, and white. It wasn't until I saw some of the prints from artists like Ruebens that I realized how subtly these 3 colors were used. I chose to do a portrait, from the waist up, and to use the textile behind the model to add red. 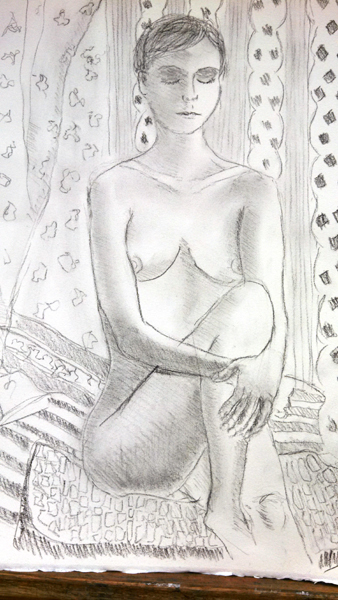 Last night our Professor began the class by showing us many Matisse drawings, in order to illustrate how figures can be placed in specific settings - using Matisse's love of textiles and patterns. He then draped the background for our model with 3 different textiles and placed her on a patterned pillow. We did our 5 minute warm up drawings and then spent the rest of the evening sketching her in one pose. Next week we are going to add color to our figure drawings, using nu-pastels. I am now finally using charcoal instead of 9B graphite pencils for drawing. The General Ex-soft pencils don't freak me out. And I am getting more used to drawing and shading with the charcoal and conte. So progress is being made. Kathy and I spent Saturday out in the City - the Metropolitan Museum of Art for Interglobal Textiles, the Fashion District annual Open Studios, and an opening at ACA Gallery for Aminah Brenda Lynn Robinson, one of my all-time favorite contemporary artists. So we decided to spend Sunday, her last vacation day, playing in the apartment. 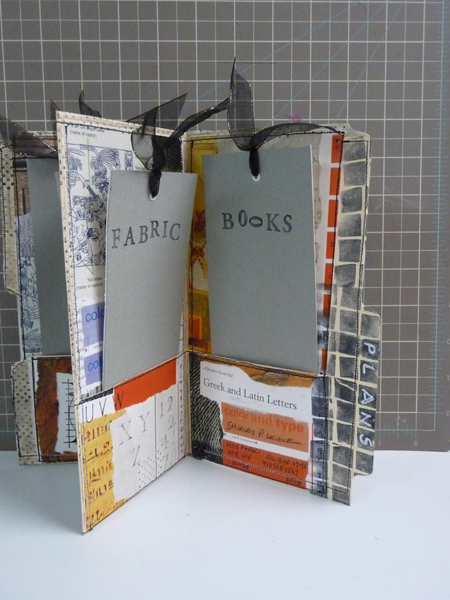 I taught Kathy how to make the File Folder Journal that I previously posted (from Cloth Paper Scissors). 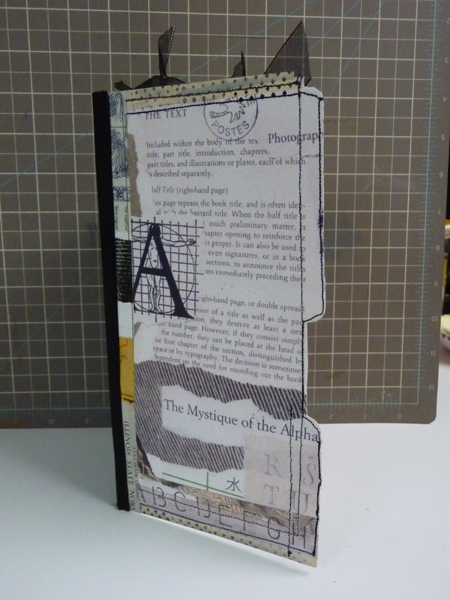 Here you can see her assembling her journal. When we finished them, she taught me how to make a bracelet with the beautiful beads on the right of the photo. 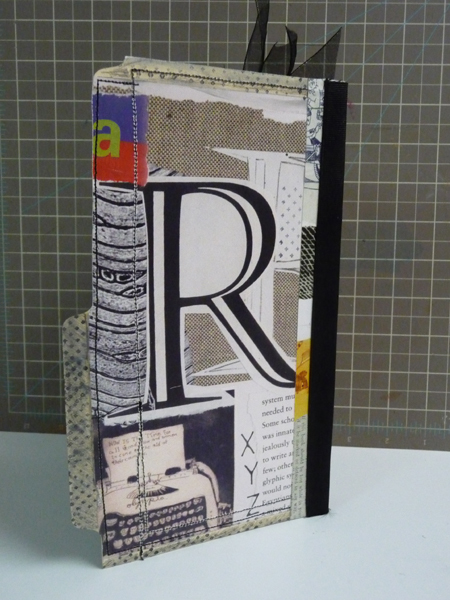 Here is my second File Folder Journal - and I'm planning to use it to keep track of my most important current projects. 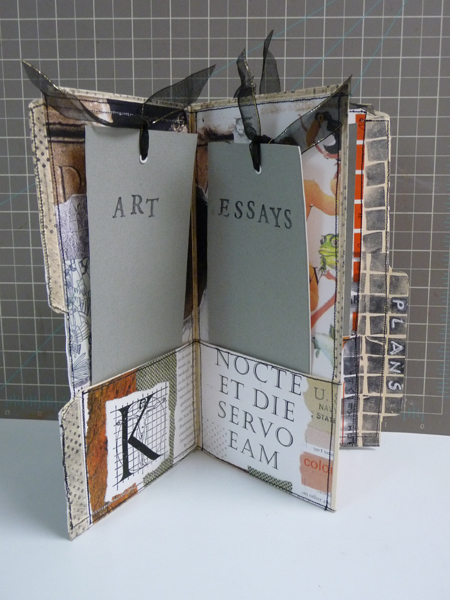 The paper used to cover the folder and the pockets is color copies of a collage book on alphabets and text that I made at the MoMA Print Studio in 2012. The cards are gray-toned Strathmore paper that I laminated to 246lb Strathmore acrylic paint paper. I rotate index card lists in and out of the pockets in front of the cards when I'm using these journals. 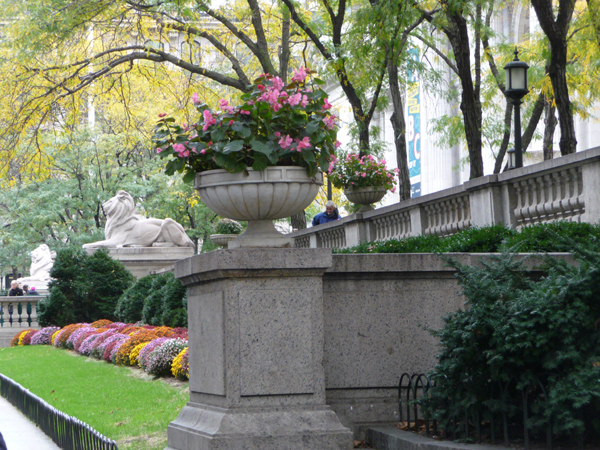 A wonderful friend from my days in San Antonio, Tx is staying with me in New York City - a regular Fall vacation for her. 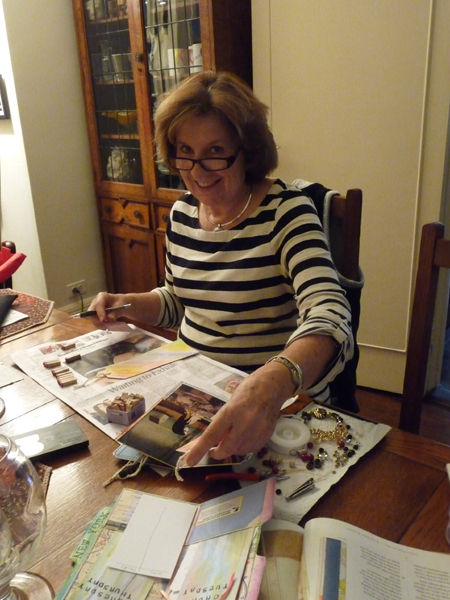 We spent 2 days with my artist frriend Pat seeing current art exhibits - but none of my pencil drawings are yet painted. So I'm going to take you on the beginning of our shopping day in the City. 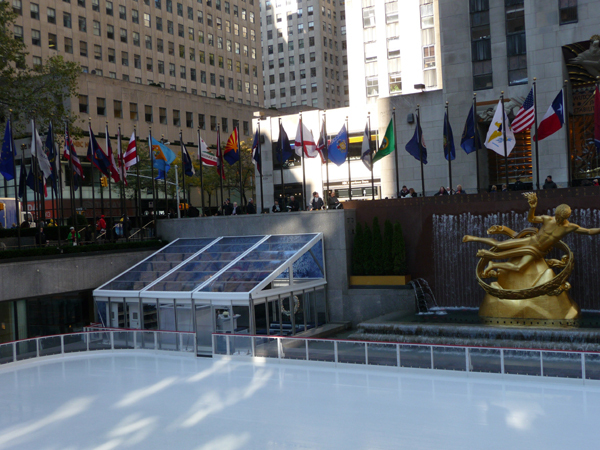 We started at Rockefeller Center - and the Zamboni just finished sweeping the ice rink. 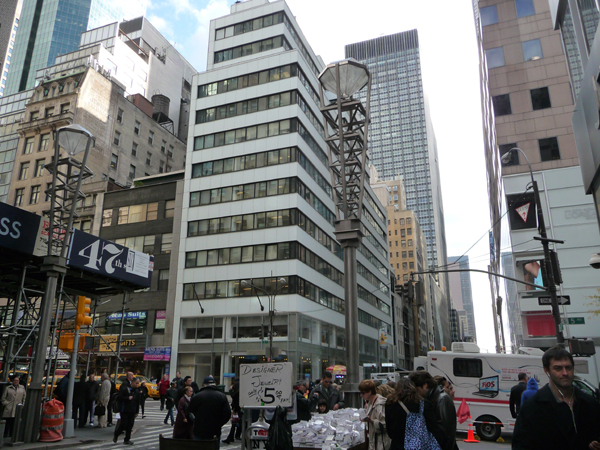 Our next stop was 47th Street's diamond district which is on 47th St. between 5th and 6th Avenues. 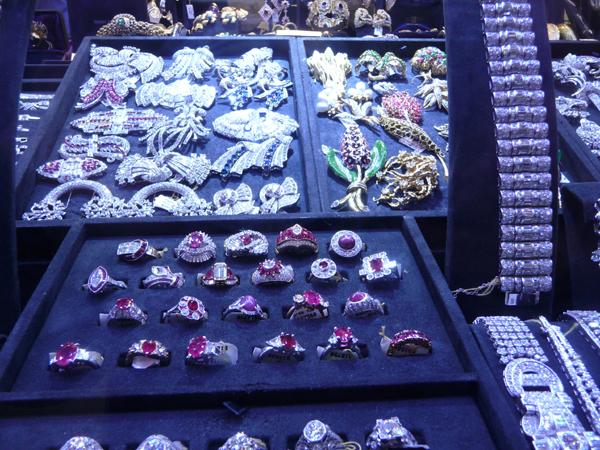 You know you are there by the tall sculptures - topped with a "diamond" at each end of the block. Cold weather arrived in NYC this week - it was 37 degrees yesterday morning. 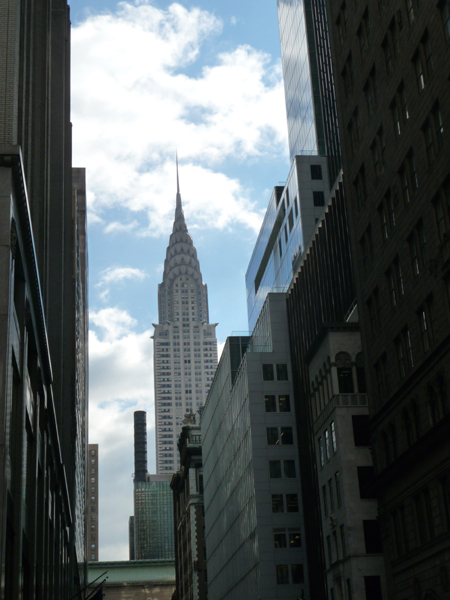 But the Chrysler Building looked beautiful in the sun - as did the front of the New York Public Library. 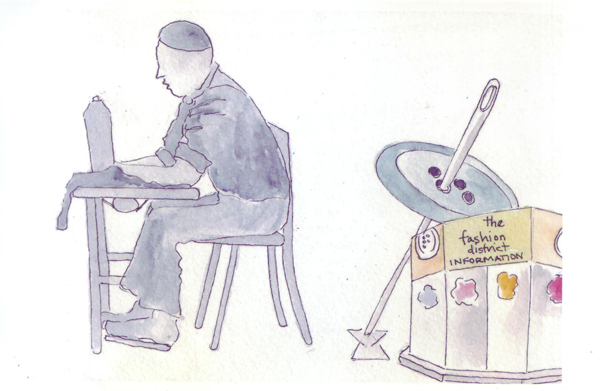 Our primary destination was the Garment District, now renamed the Fashion Center. 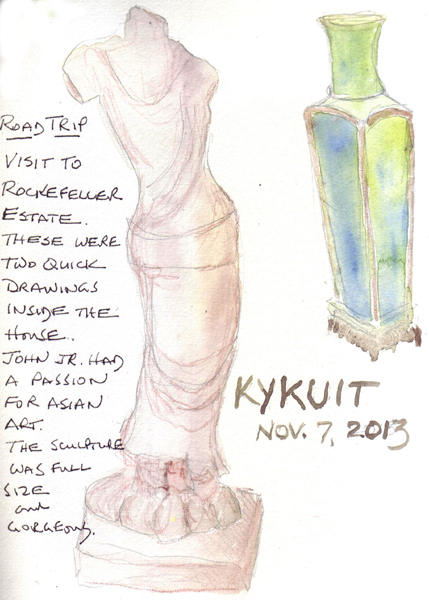 These are two sketches of the large sculptures in the district center. I did them several years ago for a tour map that I did with my friend Paula Nadelstern. I thought Project Runway fans might want to come with me to Mood and see Swatch. 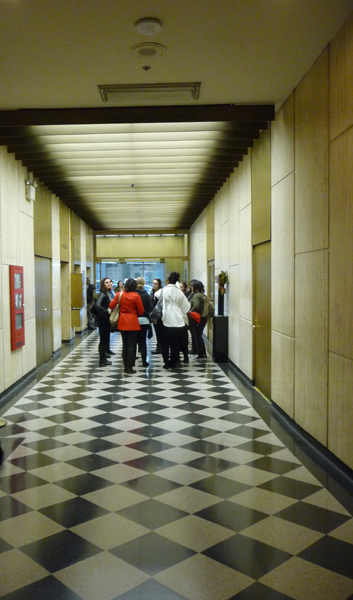 There is an office concourse between W. 37th and 38th St. and an elevator operator to take you to the 3rd floor. Rents for stores on the street level are exorbitant, so many of the best fabric shops are now on upper floors of office buildings. This is the simple entry to Mood when you exit the elevator. The store is spread over the 2nd and 4th floor by staircases within Mood. 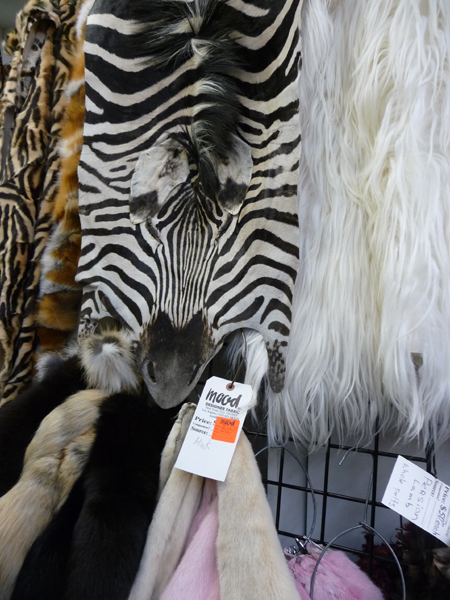 We went there to buy printed faux suede, but I thought you might enjoy seeing the real leather section - where Kathy couldn't resist buying 4 hides. And I had to show you the zebra skin, that came from the Ralph Lauren design house and was used as a wall hanging. Right below it is a beautiful pale golden mink skin! It is hard to look at some of these, but they are beautiful. 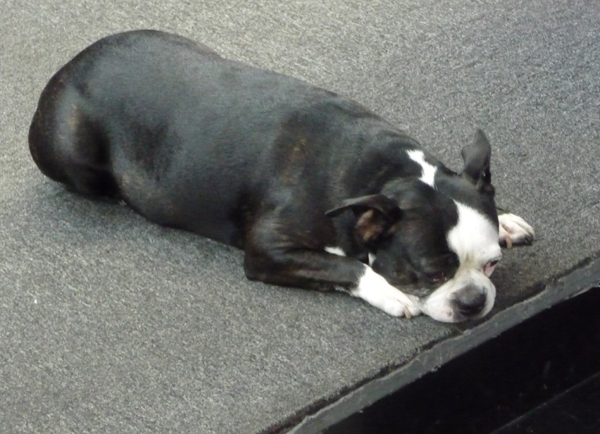 And finally, here is Swatch, who plays with Tim Gunn while the designers are buying fabric and leather at Mood. He was taking a little nap in the middle of the top step on a staircase. We then had lunch at Ben's Deli on W38th, bought more fabric at B and J on 7th Ave, got beads at Beads World on Broadway, and walked to The City Quilter on W 25th St - ending our day back at the apartment 9 hours later.